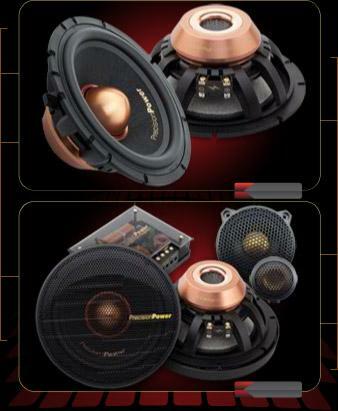 The PC components come in 2-way and 3-way models with all individual drivers using rare-earth Neodymium motors for high BL, light weight and compact size. Traditionally only tweeters use Neo motors, but we used Neo on the 2.5" midrange and 6.5" midbass as well making the drivers very strong and compact. The 6.5" uses a Kevlar composite paper cone with laminated foam backing. Paper cones traditionally yield the most natural, uncolored sound reproduction possible. We embedded Kevlar fibers into the paper for rigidity which reduces cone flexing and radiated distortion. The 2.5" midrange uses an aluminum cone for lightweight and strength while the tweeter uses a 20mm inverted aluminum diaphragm. 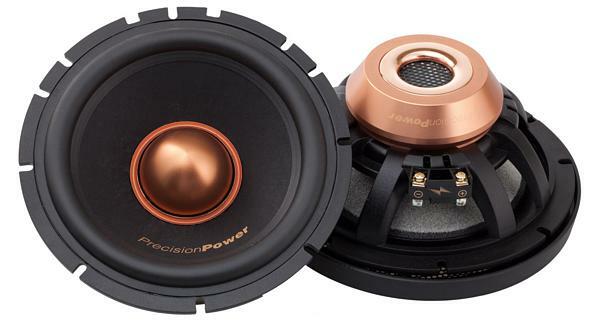 The shallow depth of the midrange allows it to mount with the tweeter on the dash, or in the A-pillar, for phenomenal staging, rather than being limited to using a 4" midrange with the tweeter and being forced, in most cases, to fabricate kickpanel pods. The crossover, thought by many to be the most important part of any component set, are truly phenomenal. There is one model that is used for both 2-way and 3-way sets. In two way more the crossover sends a high-pass signal to the tweeter at 4kHz, away from the sensitive and critical 1kHz point. The low-pass signal goes to the 6.5" midbass and is also limited to 4kHz and down. When the switch is flipped for 3-way application a 400Hz high-pass for the 2.5" midrange band. The previously empty midbass terminals now send a low-pas signal at 400Hz to the 6.5" midbass. The crossovers use top quality inductors and capacitors. The tweeter circuit includes both a bulb and PTC switching capacitor for unparalleled protection.